The Maharashtra Government has filed counter-affidavit in Supreme Court against the writ petition challenging the arrests of five activists in relation of Bhima-Koregaon case. The counter-affidavit affirmed by Dr.Shivaji Panditrao Pawar, Assistant Commissioner of Police, Swargate Division, Pune contests the maintainability of the writ petition by stating that the petitioners were total strangers unconnected with the case. "When an investigation in accordance with the Code of Criminal Procedure commences either upon an FIR or a complaint and is underway, it is only the accused persons who can maintain proceedings before the competent courts including the constitutional courts", states the affidavit. It is further stated that the writ petition is based on the individual perception of the petitioners regarding the 'eminence' of the arrested persons, media reports, and statements by 'activists and intellectuals" condemning the arrest, and not on the basis of any direct knowledge regarding incriminating facts. 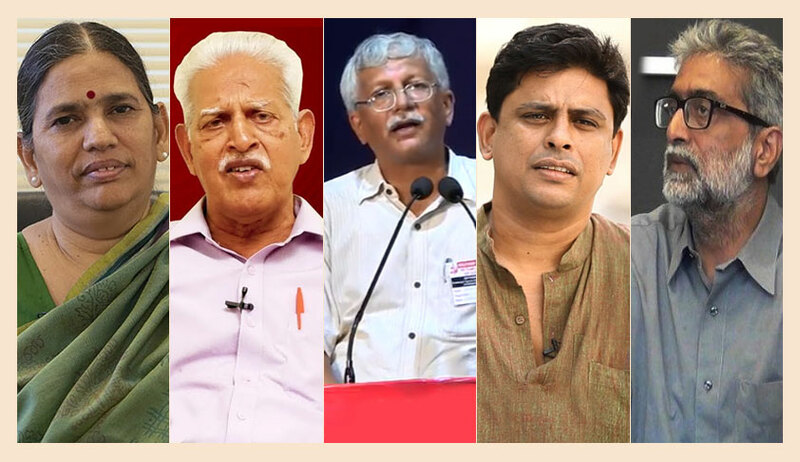 The writ petition was filed by Romila Thapar, Prabhat Pattnaik, Devaki Jain, Maja Daruwala and Satish Daruwala, alleging that the arrest was "an exercise to silence dissent, stop people from helping the downtrodden and marginalized people across the nation and to instil fear in the minds of people". The counter-affidavit traces the history of investigation, which commenced with the registration of FIR on January 8, 2018, on the basis of complaint by one Tushar Ramesh Damgude, alleging that violence in the Bhima-Koregaon parade on January 1 was incited by inflammatory speeches and songs performed by a group "Kabir Kala Manch" at the 'Elgaar Parishad' held at Shanivarwada, Pune on December 31,2017. The materials recovered from the laptops, pen drives, memory cards etc, of the persons who were initially accused in the FIR indicated their association with CPI(Maoist) and "reflected an on-going sinister design of having committed and in the process of committing criminal offences having the potential of destabilizing the society". The affidavit affirms that the the investigating agency, in order to avoid future allegations of foul-play, decided to videograph the entire procedure of conducting the search. Based on such information, offences under Section 13, 16, 17, 18, 18B, 20, 38, 39 and 40 of the Unlawful Activities [Prevention] Act were added against Surendra Gadling, Rona Wilson, Shoma Sen, Mahes Raut, etc. and certain underground persons of Maoist organization on May 17. Surendra Gadling, Rona Wilson and Sudhir Dhawale were arrested on June 6. Search carried out on their electronic devices revealed the involvement of Varavara Rao, Gautam Navlakha, Sudha Bharadwaj, Arun Ferreira and Vernon Gonsalves in the conspiracy- stated the affidavit. It is stated that the materials collected showed that "they were involved in selecting and encouraging cadres to go underground in ‘struggle area’,mobilizing and distributing money, facilitating selection and purchase of arms, deciding the rates of such arms and suggesting the routes and ways of smuggling such arms into India for its onward distribution amongst the cadres. Some of them have suggested training and laying of booby traps and directional mines. They are also found to be providing strategic inputs in furtherance of the objective of armed rebellion as per the strategic document of the banned terrorist organisation namely Communist Party of India [Maoist]". The affidavit states that the activists were not arrested for their political dissent,but for their involvement with a banned terrorist organization. The conviction of Vernon Gonsalves under UAPA few years ago is mentioned to state that the accused persons have criminal antecedents. The Maharashtra Police states that the house arrest of the activists have caused substantial damage to the investigation, and that their custody was necessary to prevent them from destroying evidence and helping other potential accused. On this premise the Police seeks vacation of the order passed by Supreme Court on August 30, whereby the activists were permitted to remain under house arrest. On August 30, the Supreme Court had ordered that the arrested activists should be retained in house arrest only, observing that "dissent is the safety valve of democracy". The police have also undertaken to produce the case diary and the incriminating materials recovered in the investigation before the Court for examination.